A multi-talented musician, Dana Perry is doing it all these days. She plays solo and with several bands, supports other artists, and teaches new musicians the craft she loves. And Perry gives every ounce of her energy and her heart to each effort. But starting this month, she is behind an even bigger endeavor to get more songwriters heard in an intimate, exclusive setting. The first Thursday of each month, beginning on January 5th, Perry is hosting a “Listening Room” at SOSONIC. She took time to answer some of our questions about it, including why she knows she is in the right place at the right time. Maximum Ink: You moved to Madison a few years ago after a friend told you about the music scene here. Has it met your expectations? 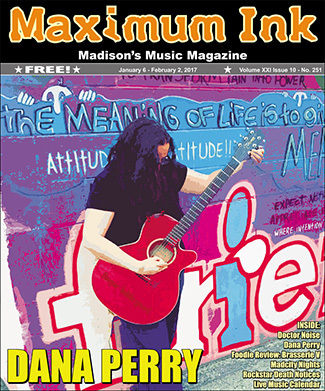 Dana Perry: Yes, he told me I would love Madison music, and that Madison would love my music. He was right! I’ve been doing my own thing for about 12+ years. I really got serious about playing guitar and songwriting when I was about 20 years old when I was still in Illinois, and making my own music had a strong pull on me, so I left school. I had been majoring in Music Education in college, and before it was involved in band and choir throughout school. MI: So music has always been a part of your life? DP: I’ve ALWAYS been in love with music, and making it my life’s focus didn’t really feel like much of a choice, more like a calling. When I was young, I liked that it was the thing grown-ups said I did well - the thing that got me attention, like lots of little people want. As a teenager and young adult, I saw it as the thing that would basically help me win at life - it could bring me “fame and fortune and everything that goes with it! I thank you all,” to quote the great band, Queen. Now at this point in my life, I’m blessed to say I’ve had several spiritual experiences with music that taught me what music really IS; that it’s Divine, that it’s POWERFUL, and that I am merely a vessel to share it. Learning this made me realize music is a Calling, and I’m humbled to be Chosen for such an Existence. MI: And you are involved in so many different projects, but lucky for us, you recently found time for another solo album. DP: Technically, this is my third solo album. It was recorded at Beth Kille’s home studio, and It was born out of a needy desire to get these songs down, to get them played. I look at my songs as tiny pieces of a grand, never-ending story. Some are a little more “delicate” sounding, and haven’t really been played until putting together this new album. But the response has been tremendous! MI: I was lucky enough to hear some of those new songs at your album release at SOSONIC. The show was really special, and now you are making the space available to other musicians? DP: I’m not thinking of SOSONIC as another “venue,” but more of a “listening room” to be immersed in each song and every word. Formerly “Sticha Brothers”, SOSONIC has been primarily known for its stellar staging and PA systems for large concerts. A small retail store and several practice rooms for music lessons was added a few years ago, and I was hired as an instructor, and to work a few days in the shop. There is also a simply BITCHIN’ rehearsal suite, which we often rent out to bands looking to rehearse in a creative space. In recent years the room has been used by Bob Dylan, Cheap Trick, Garbage, Sevendust, Mudvayne, and more. And while it will continue to be used in a variety of ways, I am using it once a month as a listening room; an intimate environment where the artist can truly fall into their music in front of an audience that is really listening. My recent solo album release show was in this room, and it was a magical experience. I hope to continue sharing that magic with artists and listeners alike. MI: When does the magic get started? DP: The first official show is January 5th, 7-9pm, and will feature Derek Ramnarace, Sam Ness, and a special one-of-a-kind set from SHESHE! The shows are $10, and limited to 30 people in order to preserve the “Listening Room” experience. We provide snacks and drinks, and tours of our beautiful facility, plus, the show will be live on Max Ink Radio, and we’re hoping to create high-quality recordings and video, to be used in a variety of ways. And save the date, the February 2nd show will highlight new music from Tin Can Diamonds, The Fancy Pears, and Katie Scullin! MI: Tell us about your other music projects? DP: I’ve been with SHESHE (a trio with Julia McConahay and Shannon Callaway) for 3 years, and my newer band Imaginary Watermelon (with Jenna Joanis, Ellie Erickson, Maggie Richardson), started a year ago, and I play solo shows from time to time as well. I’m also a guitar instructor/band coach for Ladies/Girls Rock Camp-Madison the last 4 years, and it is continuously life-changing and incredibly rewarding. Music is divine energy, and to be able to help others realize their own way to express themselves is a gift. MI: You’ve already accomplished so much here. Are there other things you have planned in the new year? DP: I am very happy with what’s happening with my music. I definitely have dreams for the future; I’d love to get some more mileage on the road, play bigger stages, record more albums, play with kickass musicians—all of it and then some! But I am just as excited about where I am in this very moment. As working musicians, I think it’s important for us to spend lots of time daydreaming about our musical futures, but at the same time, it’s important to recognize and appreciate where you are RIGHT NOW; how far you’ve come since you first started, shows you’ve played, albums you’ve recorded, people you’ve been able to play with, the influence you’ve had on friends, fans and musical colleagues. When we really stop to take a deeper look, peer through the veil of self-doubt and insecurities, many musicians like myself realize we’ve actually already gotten ourselves right where we want to be - and we’re going exactly where we want to go.